1. T.Sundararaj and S.C.Agarwal. Cell mediated immunity with Vibrio cholera L phase lysate vaccine. Presented at UGC-ICMR seminar on enteric infection held at Banaras Hindu University, Varanasi on 29th and 30th Sep 1977. 4. T.Sundararaj .Study on humoral and cell mediated immune responses against typhoid in human beings. A paper presented at 2nd congress of Indian Association of Medical Microbiologists held at Madras in Nov 1978. 5. T.Sundararaj Humoral and cell mediated immunity in human typhoid. A paper presented at 27th Annual conference of Indian association of Pathologist and Microbiologists held at Madras in Nov. 1978. 6. T.Sundararaj.,R.S.Rao et al Study of drug resistance among salmonella typhi and salmonella paratyphi in an endemic area- 1977-1979. A paper presented 28th annual conference of Indian association of Pathologists and Microbiologist held during Jan 1980 at Chandigarh. 7. Comparative evaluation of two bacteriocin typing schemes for Proteus spp. A paper presented 3rd all India Congress of medical Microbiologist held on Nov. 1979 at Bombay. 8. Study of development of cell mediated immunity in guinea pigs induce by ribonucleic acid protein fraction from Entamoeba histolytica .A paper presented at 3rd all India congress of Medical Microbiologists held on Nov. 1979 at Bombay. 9. T.Sundararaj Cell mediated immunity in human amoebiasis. A paper present at the 4th National congress of Medical Microbiologists held at Varanasi Nov. 1980. 10. Cell mediated immune response inhuman cases of Rhinosporidiosis. A paper presented at 4th national congress of Medical Microbiologists held at Varanasi Nov. 1980. 12. Detection of antigen in circulation of patients of Rhinosporidiosis. A paper presented at 29th annual conference of Indian association of Pathologists and Microbiologists held at Belgaum in Dec.1980. 14. A report on the isolation of leptospira inhuman leptospirosis. A paper presented at 5th national Congress of Indian association of Medical Microbiologists held at Madras in Jan 10-12 1982. 16. Mycological study of materials causing corneal injury. A paper presented at the 5tha National Congress of Indian association of Medical Microbiologists held at Madras in 10-12 Jan 1982. 18. Participated in the symposium on Immunity in Microbial infection at the 7th National Congress of Indian association of Medical Microbiologists at Solapur between 12-14, Nov. 1983 and presented a paper on Immunity in experimental Nocardiosis. 22. Immune complexes in pregnant women. Paper presented in the 10th National congress of Indian association of Medical Microbiologists held at Varanasi in Nov 1985. 23. Immune responses to T.gondii in pregnant women. A paper presented at the annual conference of Association of Microbiologists of India held in Madras in Oct 1985. 24. Studies of etiology of vaginitis. A paper presented at the annual conference of Association of Microbiologists of India held in Madras in Oct 1985. 26. Humoral and cell mediated immune responses in experimental Candida infection in mice. A paper presented at the annual conference of Association of Microbiologists of India held in Madras in Oct 1985. 27. Cell mediated immune response after Homospecific and heterospecific transplantation of embryonic cortical tissue into the cerebellum of Bonnet Monkey (M.radiata). a paper presented in National symposium on HLA in Human genetics and XIII annual conference of Indian society of Human genetics held in unit of Immunogenetics, school of Biological sciences, Madurai Kamaraj University, Madurai on 26-28 Oct 1987. 28. Heterospecific transplantation of human embryonic cortical tissue into the cerebellum of Bonnet monkey (M.radiata). A paper presented in the Second World Congress of Neurosciences (IBRO) Budapest, 16-21 Aug 1987. 29. Evaluation of the levels of immune complexes in cases of human malaria. A paper presented in the First one day regional (south) conference of Indian Association of Medical Microbiologists at Pondicherry in 29 Aug 1987. 36. T cell status in patients of rheumatoid arthritis being treated with WM3 (an coded unani formulations). A paper presented in Indian Association of Pathologists and microbiologists held at Bombay 1989. 37. Larvicidal effect of an Indian shrub Dodonaea viscosa linn(spindaceae) against the mosquito Anopheles stephensi. A paper presented in International conference on Biology and control of pests of Medical and Agricultural importance. Held in Madurai between 27-29 April 1989. 38. Studies on the fungal pathogen isolated from cases of keratitis. A paper presented in the Annual Conference of Indian association of Biomedical Scientists held in Madras Dec 1989. 39. Studies on the bacterial pathogens isolated from cases of keratitis. A paper presented in the Annual Conference of Indian association of Biomedical Scientists held in Madras Dec 1989. 41. Studies on the blood group in Bonnet Monkeys (M.radiata). a paper presented in the annual conference of the Association of anatomists of India held at Tamarai Porur, Madras in Aug. 1990. 47. Biological characterization of drug resistant Salmonella typhi. A paper presented in the 16th Annual Conference of the Indian Association of Medical Microbiologists held at AIIMS NEW DELHI between 16-17 Oct 1992. 50. Studies on Acanthamoeba keratitis. A paper presented at the Annual Conference of the Indian Association of Medical Microbiologists, held in medical college, Solapur, bet 18-20 Dec 1997. 51. Morphology and pathogenicity of Acanthamoeba species isolated from human corneal ulcer cases. A paper presented at the Annual Conference of the Indian Association of Medical Microbiologists, held in medical college, Solapur, bet 18-20 Dec 1997. 52. Development of lesions and immune responses after intracorneal inoculation of Acnathamoeba isolated from case of keratitis. A paper presented in the annual conference of Indian Association of Biomedical Scientists, held in Manipal between 30-31 Oct 1998. 53. A rabbit keratitis model for acanthamoeba species isolated from human corneal ulcer cases. A paper presented at the Annual Conference of the Indian Association of Medical Microbiologists, held in Kasthuriba Medical college, Manipal, between 7-9Nov 1998. 54. Evaluation of ELISA test using snail nerve antigen in serodiagnosis of leprosy. A paper presented at the Annual Conference of the Indian Association of Medical Microbiologists, held in Kasthuriba Medical College, Manipal, between 7-9Nov 1998. 55. Borrelial infections in man: A paper presented in 20th Annual conference of Indian Association of Biomedical Scientists held in Sri Ramachandra Medical college and Research Institute(DU) Porur, chennai-600116, between 1-3 Oct 1999 won Dr.Thangam Vasudevan Award of IABMS for the year 1999. 56. 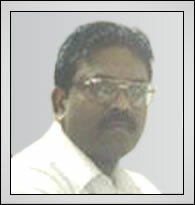 Studies on the pathogenicity of Acanthamoeba isolated from cases of keratitis: A paper presented in 20th Annual conference of Indian Association of Biomedical Scientists held in Sri Ramachandra Medical college and Research Institute (DU) Porur, chennai-600116, between 1-3 Oct 1999 won Dr.E.Balakrishnan memorial award of IABMS for the year 1999. 57. A Clinico epidemiological study of Malaria in Thiruvanmiyur - Madras city. A paper presented at the 17th Annual Conference of the Indian association of Medical Microbiologists held in Calcutta between 18-20 Dec 1993. 59 Studies on Acanthamoeba keratitis. A paper presented at the Annual Conference of the Indian Association of Medical Microbiologists, held in medical college, Solapur, bet 18-20 Dec 1997. 60 Morphology and pathogenicity of Acanthamoeba species isolated from human corneal ulcer cases. A paper presented at the Annual Conference of the Indian Association of Medical Microbiologists, held in medical college, Solapur, bet 18-20 Dec 1997. 61 Development of lesions and immune responses after intracorneal inoculation of Acnathamoeba isolated from case of keratitis. A paper presented in the annual conference of Indian Association of Biomedical Scientists, held in Manipal between 30-31 Oct 1998. 62 A rabbit keratitis model for acanthamoeba species isolated from human corneal ulcer cases. A paper presented at the Annual Conference of the Indian Association of Medical Microbiologists, held in Kasthuriba Medical college, Manipal, between 7-9Nov 1998. 63 Evaluation of ELISA test using snail nerve antigen in serodiagnosis of leprosy. A paper presented at the Annual Conference of the Indian Association of Medical Microbiologists, held in Kasthuriba Medical College, Manipal, between 7-9Nov 1998. 64 Borrelial infections in man: A paper presented in 20th Annual conference of Indian Association of Biomedical Scientists held in Sri Ramachandra Medical college and Research Institute(DU) Porur, chennai-600116, between 1-3 Oct 1999 won Dr.Thangam Vasudevan Award of IABMS for the year 1999. 65 Studies on the pathogenicity of Acanthamoeba isolated from cases of keratitis: A paper presented in 20th Annual conference of Indian Association of Biomedical Scientists held in Sri Ramachandra Medical college and Research Institute (DU) Porur, chennai-600116, between 1-3 Oct 1999 won Dr.E.Balakrishnan memorial award of IABMS for the year 1999. 66 Rajkumar,S., Addline E.P., Vanitharani,J., and Sundararaj,T. Do feeding habits influence the normal microflora of the bat’s intestine? A paper presented in the XXiX conference of the ethological society of India and National Symposium on unconventional pests. Held at the department of Microbiology, Bangalore University between Feb 23-24 2005. 67 Vivian Joseph Ratnam,P., Rajkumar,S., Addile Esther Pushparani,D., Vanitharani,J., Sundararaj,T. Isolation of salmonella species from the intestinal carriage of Taphozous melanopogon and Megaderma lyra.A paper presented in the XXiX conference of the ethological society of India and National Symposium on unconventional pests. Held at the department of Microbiology, Bangalore University between Feb 23-24 2005. 68 Sundararaj,T., Rajkumar,S., Addline Esther Pushparani,D., and Vanitharani,J. Unconventional mode of transmission of V.cholerae through Scotophilus kuhlii and pipistrullus dormeri (evening bats)A paper presented in the XXiX conference of the ethological society of India and National Symposium on unconventional pests. Held at the department of Microbiology, Bangalore University between Feb 23-24 2005. 76 Rathi P. Satyaperumal, Sasikala.S.,., M.L.Kathik Babu., T.Sundararaj., and Antony.F., Presented a paper on “PCR detection of mec gene in Staphylococcus aureus from sinusitis patients” in the National seminar on Recent Trends in BioSciences held on 23rd and 24th February 2006, at Department of Microbiology,Biochemistry, Botany and Zoology, Vivekanantha College of Arts and Sciences for Women, Elapalayam, Thiruchengode, Namakkal dt. Tamil Nadu.